The goal of the bin/setup script is quick, reliable, consistent setup. It is placed in the bin directory to match new Rails conventions about executables. Rails as of version 4.2.0 generates a bin/setup file by default. 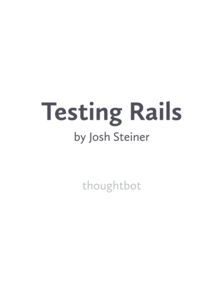 # Set up Rails app. Run this script immediately after cloning the codebase. echo "Pow not set up but the team uses it for this project. Setup: http://goo.gl/RaDPO"
The first section installs or uses cached Ruby dependencies via Bundler. The second section sets up git remotes for staging and production commands. The third section creates the development and test databases, loads the schema, and initializes with the seed data. It does not need to run all the migrations. The last two sections use Foreman as process manager, Pow as DNS server and HTTP proxy. This is just an example bin/setup file. Each project will be different. Some might not use Pow. Some might test if Redis or MongoDB is installed and run, install, or print a message if not. Some might want to pull some ENV variables into .env from Heroku. Regardless of the bin/setup file’s contents, a developer should be able to clone the project and run a single, consistent, reliable command to start contributing.